Binary compounds, which are made of two parts, are typically categorized as either ionic or molecular. Hint: Notice the colors (ie red and yellow make orange) to help you. Ionic compounds are composed of a metal and a nonmetal, whereby the metal is positively charged and the nonmetal is negatively charged. Molecular compounds are composed of two nonmetals, one acting as a cation and the other an anion. The driving force behind the formation of a compound is the attraction of unlike charges: a + charge attracting a – charge. 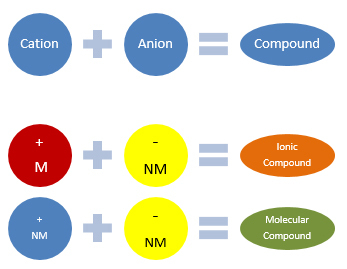 Therefore, each compound, ionic or molecular must contain a + charge and a – charge. How Is a Compound Written? Always list the cation first followed by the anion. Therefore in an ionic compound, the (+) charge metal is listed first in the formula followed by the nonmetal, (-) charge. In the molecular compound, there are two nonmetals, so again, the (+) charged nonmetal is written first followed by the (-) charged nonmetal. Recall that polyatomic ions consist mainly of nonmetals and are treated as such in a binary compound. When writing a chemical formula, you should first determine if you have ionic or molecular compound, then assign the proper charges to (+) and (-) half. According to Dalton, compounds are formed in set ratios based on charge equivalencies of the metals and nonmetals present. So knowing the right charge is necessary to write the correct formula. In a neutral compound, the total (+) and (-) charges should always be equal one another! So you must know the charge of each element or polyatomic ion to be able to form the compound using the correct ratios. You can use common denominators to help you determine how many of each atom are required to equal one another in a binary formula. These are written as subscripts. Or you can use the shortcut of switching the charges to reflect the subscripts, as in aluminum oxide, below. Double check the charges to ensure the cation halves and anion halves are EQUAL. So the + charges must equal the – charges. What about a molecular compound such as water, H2O? H is in group I so it should have a +1 charge despite being a nonmetal NOT ALL NONMETALS ARE (-) !! O is in group VI, so it will have a -2 charge. Remember they are the same any other ion—just treat them like a single unit. Even if the polyatomic ion does not have a subscript, you should put it in parentheses when there is more than one unit of it so that the ratio truly indicates how many of them you have. You should know what version or charge of that transition metal you have so that you can write the correct ratio. Typically the charge is given in parentheses after the name of the metal to indicate this. Hint: Always classify the compound as ionic or molecular and determine the elements’ charges before writing the formula.